Read our Winter 2018 issue of Bethesda Life - click here. 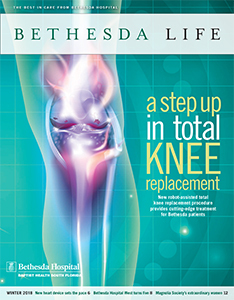 "A Step Up for Knees" - The new total knee replacement provides cutting-edge treatment for patients. "Setting a New Pace" - A new placement for a pacemaker component lowers heart failure risk. "Turning Five" - Celebrating five years of care at Bethesda Hospital West. "Magnolias Make a Difference" - The Magnolia Society helps the Bethesda Center for Women and Children. "Outstanding Community Service" - Bethesda Hospital Foundation’s 18th Annual Women of Grace Luncheon.